It's taken me a good part of this week to defrost my body and brain after the Oceanside Triathlon, so I haven't had a chance until now to actually write a race report. I do have to say though that the recovery period at the beginning of this week was very welcome, especially after a very competitive and frigid race. Yes, the extended warm summer ended just in time for this race, and the result was an eerie, cold, and somewhat sketchy (by no fault of the race directors, but I'll get into that). There are some pros and cons to doing an inaugural race, the pros being that they may typically be less crowded. That was the case this day, as only about 250 age groupers were racing. This would give us a lot of room to run our own race. The cons include poor preparedness, lack of knowledge of the course, and general first year glitches. This was not the case with Lifetime Tri, as they put on a great show with great support, and it seemed like they had been running this race for years. The one thing I noticed immediately while getting ready in transition was the incredible amount of fitness everyone had. There were some very serious athletes in this group of 250, and it was sure to be a very competitive race. I was becoming worried that I may finish last in this race, but then I reminded myself that it didn't really matter. I was here to race for myself and beat my own expectations, which at this point was break 2:30 and feel happy with the effort. I was well aware that the morning would be cold, and it didn't disappoint. As we readied ourselves in T2, the temperature read 48 degrees. However, once the sun rises it is anyone's guess as to how the temperature will swing. It could heat up dramatically, it could stay cool, or we could be buried in a cold, soggy layer of fog. As the sun rose and the pros started their race, it appeared we were in the clear and we would have a sunny race. 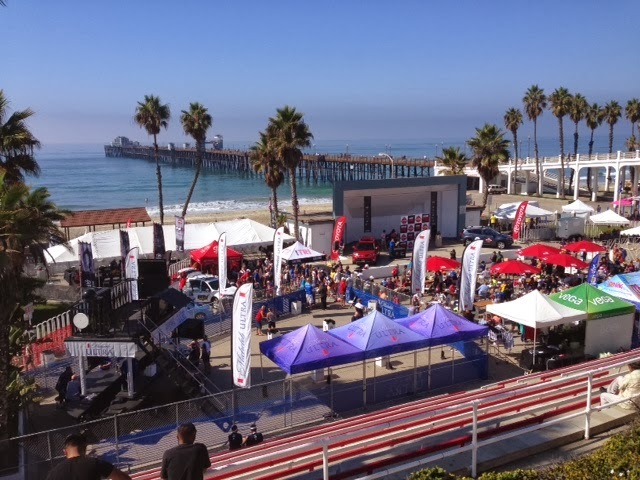 After the pros and the elites were on their way and racing for $50,000, it was our turn to get in the water. The swim followed the same route as the Ironman 70.3 Oceanside Triathlon, which takes place in the Oceanside harbor, going down the channel and back toward the boat launch. Unfortunately, we weren't allowed a warm up in the water because of the general "corral" type of swim entrance, which was concerning to me. It always takes me a few minutes to get comfortable swimming in the open water, and a warm up would have helped me to start my race in a good place. Fortunately, the water was a comfortable 65 degrees and I decided to take it slow at the beginning and warm up that way. I figured everyone else was doing the same thing. No sooner than we got in the water did a blanket of thick fog begin to sit on us. We had no sights on the buoys, and thus no point of reference with which direction to swim. Once the horn went off, we all just started swimming in the general direction we thought we needed to go. 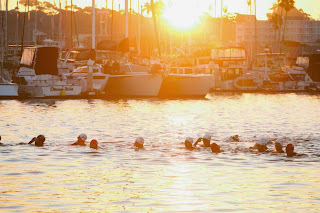 The race got an eerie start, and I was going on faith that the swimmers in front of me were going in the right direction. Occasionally we would pass a lifeguard who was pointing in the direction we were going, but how could we be sure that they knew where they were directing us? Perhaps they were just pointing in that direction because we happened to be going that way. If this swim was in the open ocean I would be worried, but we were in a harbor, so we were bound to bounce off of something eventually if we got lost. I was able to draft off of the lead group for about 2/3 of the race, which served two purposes. First, it conserved my energy and helped me to go faster, and second, it helped me to use them as my eyes. Occasionally I would hear one of them say "which way are we going? ", but I'd let them figure it out and continue drafting. The strange thing about swimming in heavy fog without any sighting is that you have no clue how far you have swam and how far you have yet to go. You just keep swimming until someone points you around a turn buoy. I had never known until this point how beneficial it is mentally to actually have points of reference, otherwise you feel like you're going nowhere! During the final stretch I lost the feet of the group ahead of me and they pulled away rather quickly at that point. I then discovered that I was leading my own pack of swimmers who was drafting off of me. That was a first! As I exited the water, I felt happy to be done with the swim, but still felt very disoriented, and thus forgot to take my wetsuit down to my waist (which lost me a lot of time in transition). At this point I had no idea where I stood in placement, so I was rushing quite a bit. I would learn later that I was 7th out of the water in my age group (out of 25). Out of the water and up a boat launch ramp. I was able to take my goggles and cap off, but completely forgot to take down my wetsuit. As I reached my bike, I realized my error and started frantically peeling it away. It's always tough to get it over my wrist watch, which cost my precious extra seconds. By the time I got my wetsuit off I was disoriented and trying to remember what needed to be done next. I finally got my nutrition in my pockets, helmet on, and then I remembered to put everything in my wet bag (to be brought back to transition 2 after the race). I looked at my arm warmers and thought to myself that I better save the time and keep them off. Big mistake! I threw them into my wet bag and went on my way. This is about what it looked like exiting T1, into a thick layer of fog which became worse as we got onto the highway. We were warned that the beginning part of this race was bumpy with some precarious turns leading out to Highway 76, so we were advised not to start racing until we reached the highway. I followed that advice, and as a result was passed by a few people on the way out. But we had 25 miles to go, so I was fine with that. A few turns to get out of the harbor, and then onto PCH for about a quarter mile, then a left turn onto the highway were I would spend the next hour or so battling cold and fog. The initial part of the bike I was comfortable, and not terribly cold, but as I started to pick up speed it was clear the cold air was going to be painful. The air itself was not necessarily cold, but the condensation in the air would stick to my skin and form little droplets all over my exposed arms, legs, and face which, when hit by 20 mph steady winds, would freeze the skin. "Oh well," I thought. Everyone else was dressed the same way as me, but the faster we would go, the more we would be punished. Now it became a battle of who could withstand the most pain. As far as my pace, it felt effortless, and I wasn't nearly exceeding my race heart rate. In fact, the strain I was feeling was directly related to the cold, and not my effort, which was a strange sensation - the feeling that I could easily go harder but my muscles weren't cooperating as well as they otherwise would have. Once on the highway I was averaging about 22-23 miles per hour, and I was passing a number of racers. Also, I was being passed by a number of pros going into their second lap. This was a clear demonstration of the fitness gap between pro and amateur in this sport. The second lap became a lot more crowded, and I was a lot more cold, so I decided to settle in behind a group of racers that were going about my speed. Rather than pass them and use up excess energy, I decided to conserve it for the run and defrost a little. Besides, getting out in front in the fog is not a preferred position. If a rider went down ahead of us, we wouldn't be able to see it in time to stop. Back onto PCH and into the pier area, I was happy to be off the bike and ready for a run. Nutrition - 250 calories of Carbo Pro plus 2 homemade oat/honey/almond butter clusters. I had more trouble in T2 because my fingers were numb, and I couldn't easily grab things or put my shoes on. Finally did, and was out on the run course. My goal on the run was to do my sprint pace at the Olympic distance. This would come out to about a 7 minute mile, a pace that has proven just out of reach in recent races. Unfortunately, nature called at the beginning of the run, and I had to hit the porta potty. I still haven't been able to bring myself to pee on the bike, which will become necessary as I get into the longer distances. This is more of a psychological issue than anything, as we spend our whole lives doing everything we can not to pee on ourselves. This is one of those rare exceptions which is made worse by the fact that you are working at an increased intensity. Quick 20 seconds in the bathroom and I was off again. I was still having strange sensations while running, due to being numb all over, but not necessarily being tired. I kept trying to push through and warm myself up. Soon I was having a few GI issues. Again, I just powered through and kept going. The course was mostly flat, but mixed in were a few short, killer hills. The strand connects to Pacific Avenue via a very steep climb, which was really challenging. Once I ran up the hill for the last time, I hit the gas and started running sub 7 miles. I felt great going into the finish and was able to finish in a full sprint. While my pace wasn't what I wanted it to be, I felt that I did my best given the conditions. I am absolutely happy with my finish at this first Olympic distance effort. My goal was to finish in under 2.5 hours, and I did so in 2:27. After less than a year of putting in smart exercise and healthy diet, I have been able to maintain a front of pack performance on a 2.5 hour triathlon. When I think back to when I started training back in February, and how weak, slow, and unfit I was, I am amazed with the improvements I have made. My pace back then was just under 12 minute miles, yet I was patient and gradually it improved. I am now more motivated than ever to keep training for the longer distances. Speaking of longer distances, I now head into the more "ultra" range of triathlon. 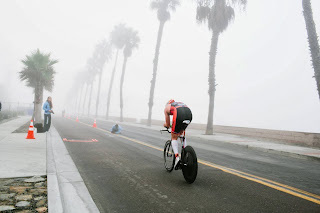 My next race is a half Ironman distance in Palm Springs in December, the HITS Triathlon. After that race, I will be preparing for the full Ironman in March. Things are getting real now. We are only a few short months away, and we are getting into some long distance now. I am actually looking forward to that, as I want to be at the more steady paces, not the fast paces I have been at. I'm ready to show that I can pace myself and do the distance. As I mentioned, Lifetime put on a great show, and I would love to do another one of their events in the future. Within a few minutes of the race finishing, the sun finally came out and it became a beautiful day.